Where does the Earth begin? Would you this number find? The so called "carpal tunnel" is a small passageway through the "carpal" bones in the wrists and hands. Nine tendons and a bundle of nerve fibers use this tunnel to reach the fingers. If any of these tendons become inflamed, the median nerve ( also running through the carpal tunnel ) becomes compressed due to the limited space of this channel. This can cause irritation, numbness, chronic pain and loss of motor function in the hands. If left untreated, there is the possibility of permanent damage to the nerves. The modern method for treating carpal tunnel syndrome once it has reached a severe state is surgery. A surgeon "scrapes" the carpal tunnel to allow more room, thus relieving the pressure from the median nerve. The effect is immediate. However, any tendons which may have been severed during the surgery must be "tied" back together. In rare cases, since a tendon is a high tension muscle, it does not heal, and remains permanently severed. Anti-inflammatory drugs are also used in the treatment of carpal tunnel syndrome, usually with only temporary relief. Wrist braces, arm bands and wrist wrests are also used to take the stress off of the tendons. Sometimes, the effects can be slowly reversed using muscle retraining methods such as Qi Gong ( a Chinese method ). Relearning proper use of the hands is a key factor in recovery, especially for those who perform repetitive tasks, such as typing on a keyboard, playing musical instruments-- any non-grasping function. Carpal Tunnel Syndrome is becoming more and more of a concern in our culture. The hands, designed by nature to be used to grasp, are called upon to do more and more "pressing" functions, and in a manner that does not allow for the proper use of muscles and tendons. It's cause, according to some, is twofold: 1) Improper diet - Inflammation and swelling is often due to the body's inability to eliminate toxic conditions within itself. 2) Misuse of the entire arm(s) affected from the shoulder to the tips of the fingers. Stress is a very common contributing factor to this condition. If someone would have walked up to me ten years ago and said: "Hey, just slap some mud on your arm, that'll fix it!" I would have walked away wondering why that person wasn't locked up somewhere. My own personal recovery from Carpal Tunnel Syndrome took 8 months, cost me one job, and almost resulted in the loss of use of my left hand ( I'm left handed ). The only reason I became motivated to change my "hand habits" was the fact that I love to write. The loss of my left hand would have been a blow to my heart, and provided a great motivation to find a non-surgical solution. As far as I was concerned, surgery was out of the question. A friend of mine no longer had the use of her right hand due to complications arising from just such a surgery. She will be on disability for the rest of her life barring no medical breakthroughs. I had lost the ability to drive ( I had a truck with a manual transmission at the time ) and my "word processing" speed fell from 145 wpm to under 40 wpm in about one month. I would soak my hands in piping hot water many times daily for relief from the pain. 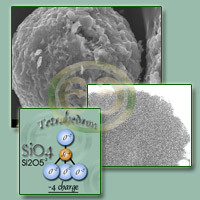 At that time, unfortunately, my studies had not yet led to Bentonite and healing clays. I had to learn relaxation methods, since I carried a great deal of tension and stress in my body. My intuition led me into a Chinese goods store, where the store manager, who saw that I was holding my arm in pain, exclaimed, "I know just what you need!" He handed me a set of Baoding Balls used in Qi Gong. I twirled the jade balls maybe three times in my left hand, then fell to the ground in pain. I knew these were just what I needed; that this was an answer to an unspoken prayer. Over the next few months, I redesigned the muscle structure in my arms back to their "natural" condition. Slowly the pain subsided. When first starting out with Qi Gong balls, one should choose a size and weight that comfortably fits in the palm of the hand. As the muscles are strengthened, it is often advantageous to switch to larger and heavier sets. 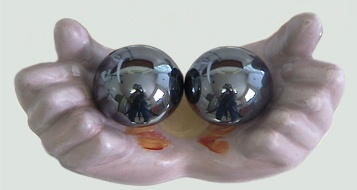 One rotates the balls in the hand, always keeping the balls touching until one achieves greater levels of mastery. Both hands need equal treatment, and the balls should be rotated in BOTH directions in each hand, even though this may at first seem extremely difficult! This is critically important to developing lasting habits, and has many beneficial side effects. At first, depending on the severity of one's condition, only use the balls for a minute or two at a time, switching hands as needed. While the novice may find it nearly impossible to accomplish, the flexibility of the fingers WILL increase with practice. When practicing Qi Gong, allow the upper arm and shoulder to relax as much as possible, with the lower arm extended and exactly perpendicular to the ground, so that the arm actually forms an "L" shape. At first, the wrist may not be strong enough to stay parallel to the ground. As time progresses, try to adjust use so that the center of the palm ( facing upward ) is always parallel to the ground. The lower arm should be perpendicular with the front of the body as well. Use should be adjusted to accommodate individual conditions. One need not overuse the balls. In the event one experiences any pain, simply reduce the amount of time practicing. In time, balls that are as much as 20 times the original weight may be used. In fact, with practice, anyone can use as many as four balls in each hand simultaneously! There are many, many benefits of this particular method of Qi Gong, most of which lie outside of the scope of this work. The practice increases circulation to the entire body, and massages the accupressure points on the hand. Slowly, the muscular structure of the arm is reformed to a much more natural state. Pain subsides. Strength returns. A year or so after my recovery, I discovered healing clay. Since that time, I have witnessed several very rapid recoveries from carpal tunnel syndrome ( see the forthcoming section on personal healing stories ). However, one will achieve far more lasting results by changing the conditions which initially created the problem! Hydrated Bentonite clay wraps properly and gently heated and applied completely around the wrists ( about 1/2 - 3/4 inches thick ), covered, and left on overnight, have a tremendous impact upon Carpal Tunnel Syndrome usually within forty-eight hours. Some people have reported increased localized pain and stiffness after the first night's application. However, these same people then have reported a lessening of pain after 48 hours, and complete relief after 72 hours. Full motor control in the severe cases I've seen is usually regained within three weeks of continued treatment. In two people that I've seen, the pain began to return two months later; one treatment of clay relieved all pain. How can clay possibly accomplish this? The answer is as simple as it is mysterious. In his article "True Carpal Tunnel Syndrome" ( Paul R. Martin, McHenry NeuroDiagnostics, McHenry, Illinois, copyright 1996 ) Paul writes "Anything which will promote circulation, help to relieve inflammation, aid in removal of local toxins, and soothe irritated muscles and tendons will help Carpal Tunnel Syndrome." 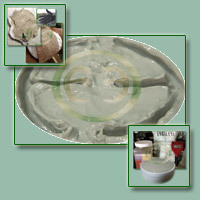 Healing clay packs worth energetically with the human system. By actually pulling contaminants through the skin ( due to its electromagnetic properties ), the clay reduces swelling / inflammation and stimulates the immune system. 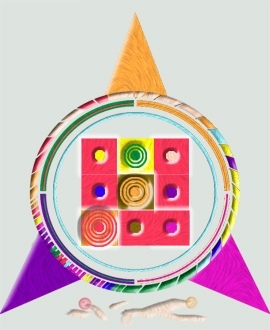 An energy exchange that occurs in a strong clay action is so evident that it can be visually measured. With a subtle radiation that is so minute it is nearly impossible to detect, the clay also increases the flow of energy to the area being treated. This phenominon has neither been fully explored nor explained by modern science ( to our knoweldge ). Due to the energy exchange and the immune system stimulation, one should always use the pinpoint treatment method, i.e. Never treat more than one condition at a time. Clay synergistically works with the body. 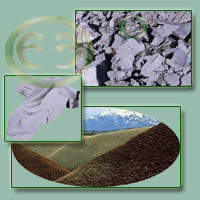 In union, the clay and the body work to activate subtle energies to restore the body to greater states of equilibrium. Please note that in my own personal studies, I used a very high quality clay which I processed and prepared using my own methods. I have never seen a store bought clay or any other marketed clay as potent for healing purposes as that which I have used. However, the principles are the same, and anyone who prepares store bought clay properly should experience excellent results. The image above shows natural bentonite clusters on a sloped embankment. After fragmenting off of a partially exposed pure subterranean vein due to minute amounts of moisture, the clay chunks (shown on a previous page) are further refined by a process of a) SLIGHTLY increased levels of moisture b) extreme heat from a low-desert sun which c) organizes the bentonite on a higher energetic level and d) fragments the original clay chunks into the above. 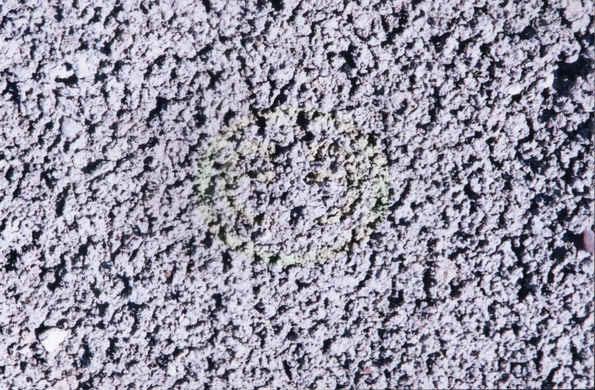 The conditions for this occurrence are rare; too much environmental moisture ( through increased rainfall or high humidity ) produces a clay sludge filled with contaminants or yields a sandy powder, either of which reduce the clays natural healing effects tenfold. "What is the evolutionary significance of plant toxins and animal anti-toxin behaviour? From a plant's evolutionary perspective, a seed should be high in nutrients to support germination and seedling growth; the ripe fruit around the seed should also be nutrient-rich and attractive to animals, encouraging them to pluck and eat the fruit and disperse the seed. On the other hand, the seed itself should be repulsive to animal consumers, inducing them to regurgitate or defaecate it, and the unripe fruit should be repulsive, lest animals harvest it before the seed is viable. From an animal's evolutionary perspective, an ability to defeat the plant's toxin defences would enable it to obtain the nutrients in the seed as well as those in the ripe fruit, and to outcompete other animal consumers by harvesting the fruit while it is unripe and still unpalatable to them. "Any textbook of animal biology describes the resulting evolutionary arms race, in which plants evolve increasingly potent toxins (such as strychnine and quinine), and animals evolve increasingly potent means of detoxification. While enzymatic detoxification has previously received the most attention, the work of Gilardi et al.10 and the wide distribution of geophagy among animal herbivores suggest an additional important means of detoxification by adsorption on ingested soil minerals." I have a similar story of pain. My EMG revealed bilateral very severe Carpal Tunnel. I was so thankful to come across this article. As I am having surgery Friday, I still believe Qi Gong balls and Healing Clay will speed up my healing.